In only a short half-century, women have taken their places as creative forces for shifting the constructs of families and communities and are shaping the world they want. This new wave, the women effect, is about the extraordinary willingness of women to be open in the face of great loss, grief, hope, and fear, and to transcend personal difficulties and anxiety to serve their communities and make change happen. 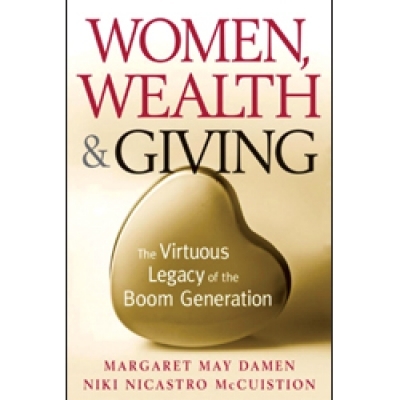 Women, Wealth & Giving draws from the combined experiences of Margaret May Damen’s career as a Certified Financial Planner, investment advisor, and endowment gift planning design specialist and that of Niki Nicastro McCuistion’s as a nonprofit founder, CEO, and consultant. Written both for boom-generation women—born between 1943 and 1964—who want to create a formalized and strategic giving plan, as well as for fundraisers and development officers who need to better understand the giving culture of women boomers, this book will inspire you to impactful, intentional action resulting in personal and community change. If you want to make a difference by leaving a legacy of hope, love, and compassion for future generations, you have a common destiny with 43 million of the wealthiest, healthiest, and best-educated women to hit midlife. This uplifting book shares the stories of some of these wise women and how they have found fulfillment through giving. With over 43 million boom-generation women at or nearing the age of retirement, the American population is reaching what has been described as the great wealth transfer, and with women outliving men, or choosing to live alone, the role of women in decisions concerning philanthropic dollars will be critical to the economic, political and moral fabric of our society. Get Women, Wealth & Giving and discover the transformative power of women’s philanthropy.